Crosby Shackles are available in a variety of sizes and styles. Shutterlock sources only from leading manufactures, reassuring you of the standard of our products. Capacities 1/3 through 55 metric tons. 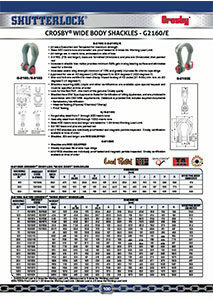 Working Load Limit and grade of material “6” permanently shown on every shackle. Hot Dip galvanized or Self Coloured. 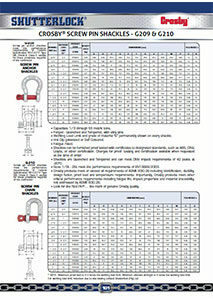 Shackles are Quenched and Tempered and can meet DNV impact requirements of 42 joules at -20oC. Sizes 1/2t – 25t meet the performance requirements of EN13889:2003. Look for the Red Pin®…. the mark of genuine Crosby quality. Shackles 55 metric tons and smaller can be furnished proof tested with other certification when requested at time of order. Material Certification (Chemical) must be requested at time of order. Shutterlock offers Bow shackles in a wide range of a variety of styles, types and fabrications. For more information on our range of Bow shackles contact us today. Bow and bolt are Certified to meet charpy impact testing of 42 joules (31 ft-lbs.) min. ave. at -20 degree C (-4 degree F). All 2160 shackles are individually proof tested and magnetic particle inspected. 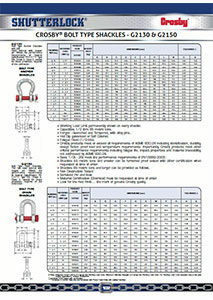 Shackles 18t and larger have DNV Type Approval to Rules for Certification of Lifting Appliances, and are produced in accordance with DNV MSA requirements. Databook is provided that includes required documents. Look for the Red Pin® …the mark of the genuine Crosby quality.